Hey little flower child! The Raskullz Peace Love Kitty PVC helmet puts a new spin on the Raskullz classic kitty. A colorful mix of flashy glitter, printed peace signs, leopard print and a heart share a message of happiness. But its not just fun and games with Raskullz Sparklez Peace Love Kitty helmet. SKU: 8034111 8034112 20440010-PNK. 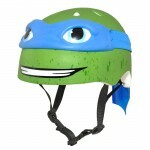 Category: HELMETS.